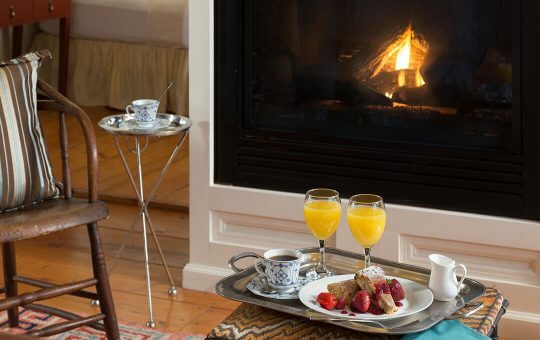 If you want to add an extra special touch to an already unforgettable romantic vacation, consider adding one of our special packages to your stay at our top rated luxurious & romantic New Hope bed and breakfast. 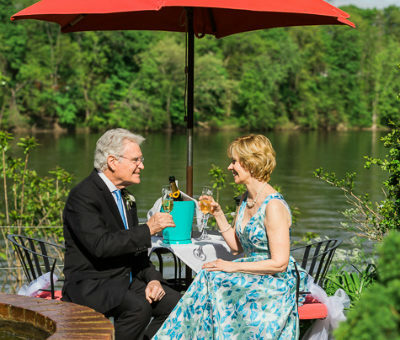 Whether you are here with the one you love on a romantic getaway, hoping to relax with friends on a spa weekend, or looking for a Pennsylvania travel package, we have a number of enhancements to make your stay extra special. We offer beautiful rooms, comfy beds, delicious breakfast options, and a warm and welcoming staff. Book your April getaway and add this $125 value! Early check-in begins at 1:00 pm, check-out extended until Noon. Sparkling Cider may be added in place of alcohol. Valid on new reservations only and may not be combined with other offers. 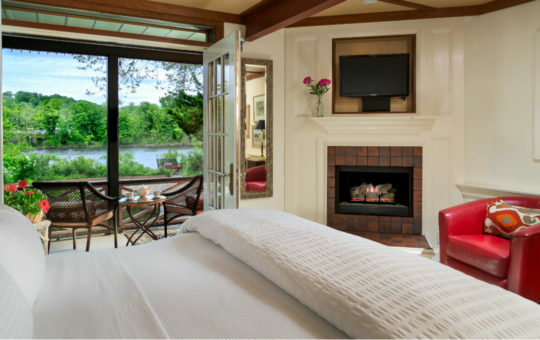 Join us for 2 nights Monday – Thursday in one of our luxury suites through April 25th, 2019 and take $50 OFF per night. $50 Off per night in select rooms only Monday – Thursday. Valid on new reservations only and may not be combined with other offers. 2 night minimum stay required. $50 OFF per night in select rooms for stays during May, 2019. Hurry, this limited time offer must be booked by April 30th to receive discount. 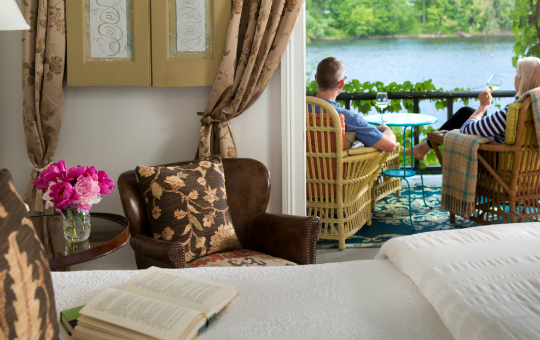 $50 Off per night in select rooms only Sunday – Thursday, excluding May 26 & 27. Add this package to your stay for $150 – a Savings of $40 Off the retail price. Sparkling cider may be added in place of Prosecco. Must be mentioned at time of booking and may not be combined with other offers. 48 hours advance notice required. 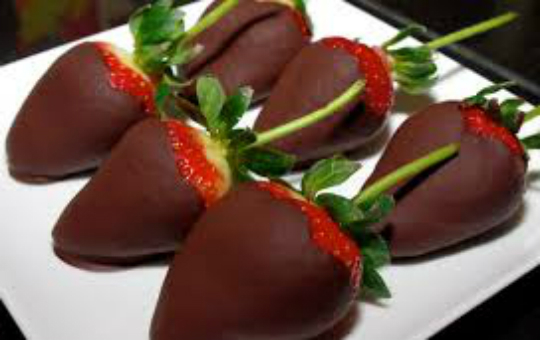 The perfect gift for Mother’s Day, Graduation Or any special occasion! – a relaxing getaway! Order a gift certificate online today! A delightful indulgence to enhance your stay. $79 in addition to room rate. 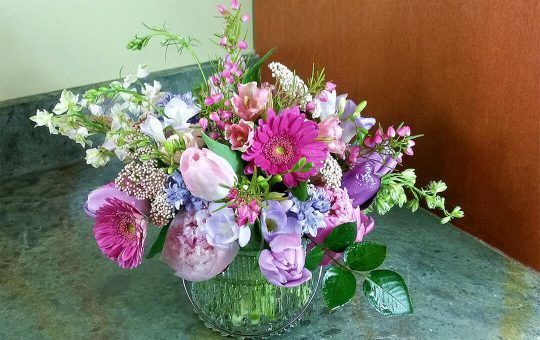 A lovely surprise, and we do all the work. $185 in addition to room rate. 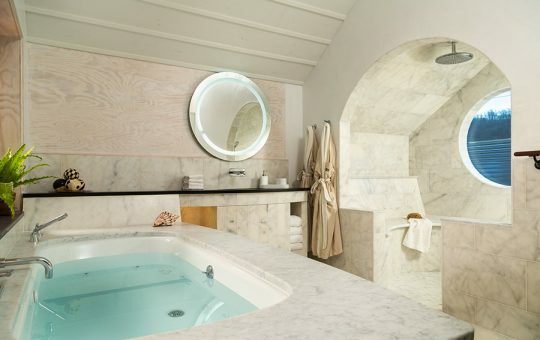 Pamper yourself in one of our Premium Rooms or Luxury Suites. 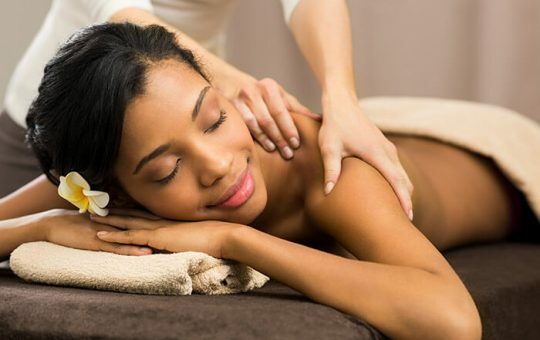 In-room massage for two, one hour each – one massage therapist. $240 in addition to room rate. Massages are offered by a licensed independent contractor. Appointments must be made directly with massage therapist. $280 in addition to room rate. Massages are offered by licensed independent contractors. Appointments must be made directly with massage therapist. 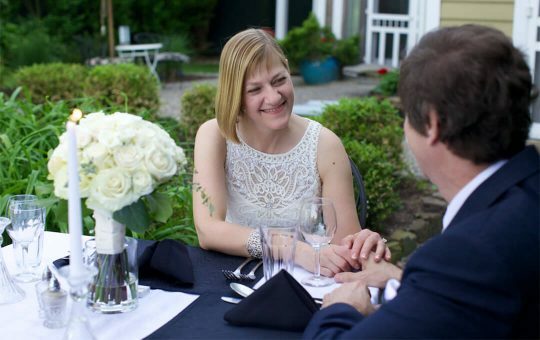 We are hopeless romantics at Bridgeton House and we have created this very romantic package just for you on your special day – Let us do all the work, so that you can focus on your love . . .
$270 in addition to room rate. Our Romance Package is a wonderful addition to your room rate. Celebrate your love with this add-on. Our inn was selected as a Top Ten most Romantic Inn in the USA, so we are a perfect destination for your romantic honeymoon. 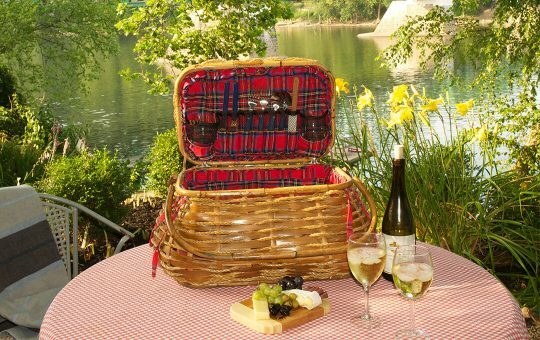 Our honeymoon package combines a wonderful Filet Mignon picnic basket, with a beautiful mixed bouquet of seasonal flowers, and much more. 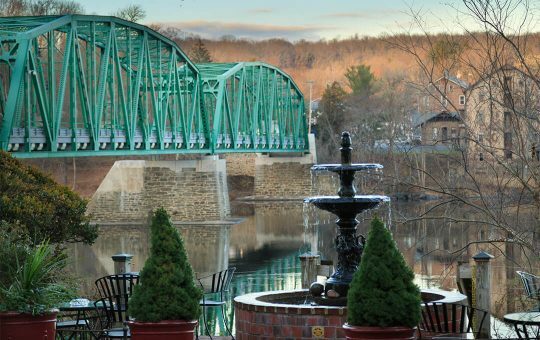 We’ve teamed with up with the Cascade Lodge at Durham Springs (one of our favorites) for Visit Bucks County Restaurant Week. 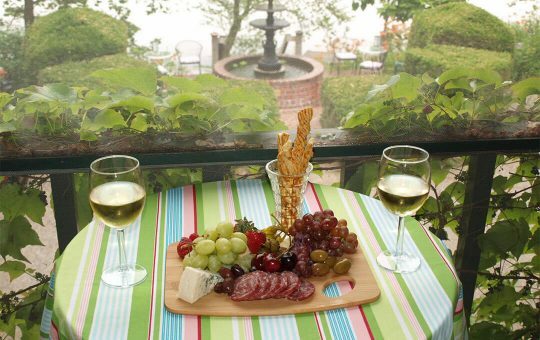 Then enjoy Dinner at the Cascade Lodge with their 3 course prix fixe dinner for $35. Early check-in begins at 1:00 pm*, check-out extended until Noon. 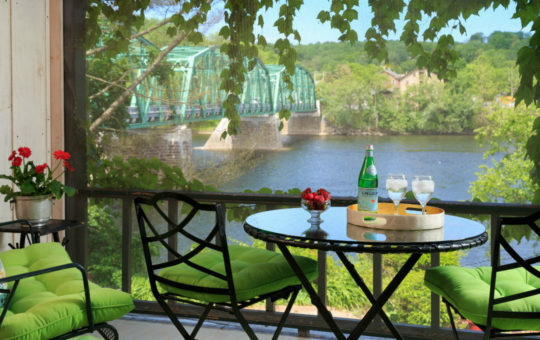 The package valued at over $100 is complimentary with stays during Visit Bucks County Restaurant Week. *We do our best to have all rooms on this package ready for 1 pm check-in; however depending on volume rooms are guaranteed at 2:30 pm. 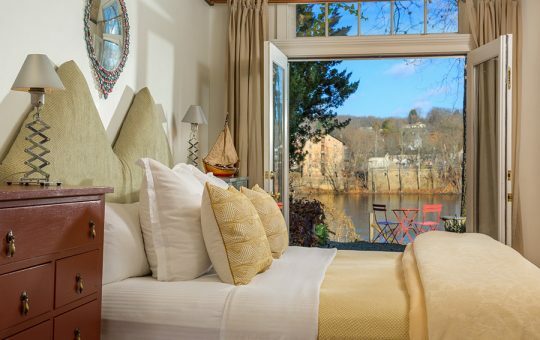 Nothing is more romantic than waking up to your river view and enjoying breakfast in bed! Add this package to your stay and enjoy a multi-course breakfast delivered to your room to enjoy in bed or on your riverside porch/balcony. You can even have it delivered to our riverside terraces, weather permitting. The ultimate in romance! Sit back, relax and enjoy the view! Have one of Chef Karen’s cheese trays awaiting your arrival! Details: 24 Hours advance notice required. Put a little romance in your life! This beautiful basket is waiting for you on arrival or at your chosen time. 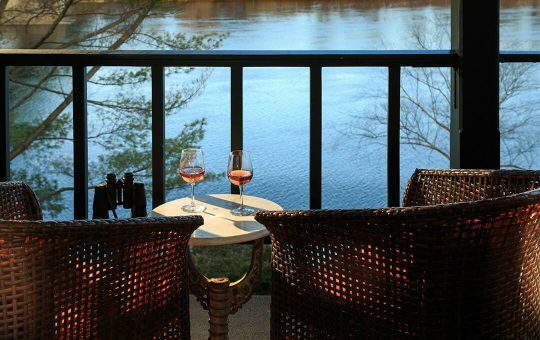 Experience romance on the riverside terraces, your private porch or fireside in the cooler months, in our dining room or your private room. Details: 72 hours advance notice required. $100 basket deposit required. Wine not included. Cancellation of package requires 72 hours notice or food charges stand. An unforgettable night- Celebrating a milestone or popping the question? It does not get any more romantic than this gesture. Multi-Course Candlelight Dinner – designed just for you! Pricing: $250 in addition to your room rate, plus tax & gratuity. Wine not included. Cancellation of package requires 72 hours notice or food charges stand. GUESTS OF THE TREE HOUSE, BOAT HOUSE OR PENTHOUSE can have this package served in the privacy of their suite for an additional $100. Please call our front desk to add this upgrade. Details: 7 days advanced notice required, and based on chef availability. Speak directly to chef Karen for menu planning. A lovely surprise for your love. A gift bag with Thymes Eucalyptus Body Lotion & Thymes Eucalyptus Body Wash. Love note included upon request. 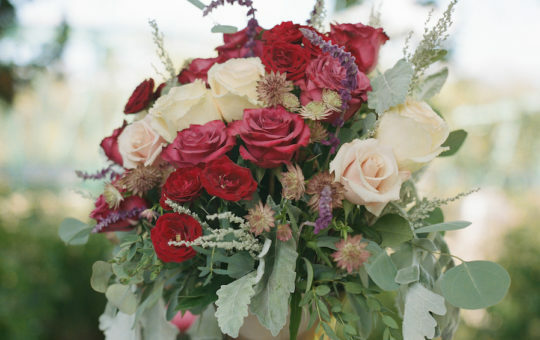 Have a sweet seasonal bouquet waiting in your room upon arrival. In a lovely take home vase. We’ll include a love note upon request. 24 hours advance notice requested. One dozen stunning long stem roses waiting in your room upon arrival in a lovely take home vase. We’ll include a love note upon request. 24 hours advance notice required. One 60 minute massage in the comfort of your room. Available only in one of our Premium Rooms or Luxury Suites. Massage must be booked directly with therapist and advance notice is required. 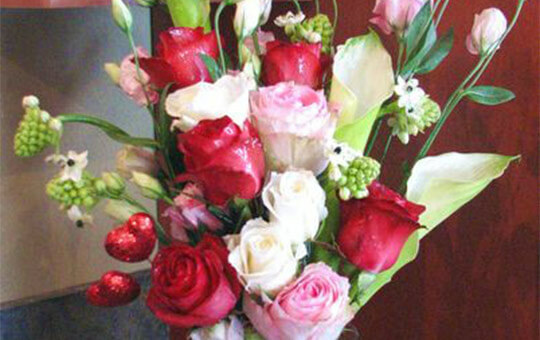 Two dozen stunning long stem roses waiting in your room upon arrival in a lovely take home vase. We’ll include a love note upon request.